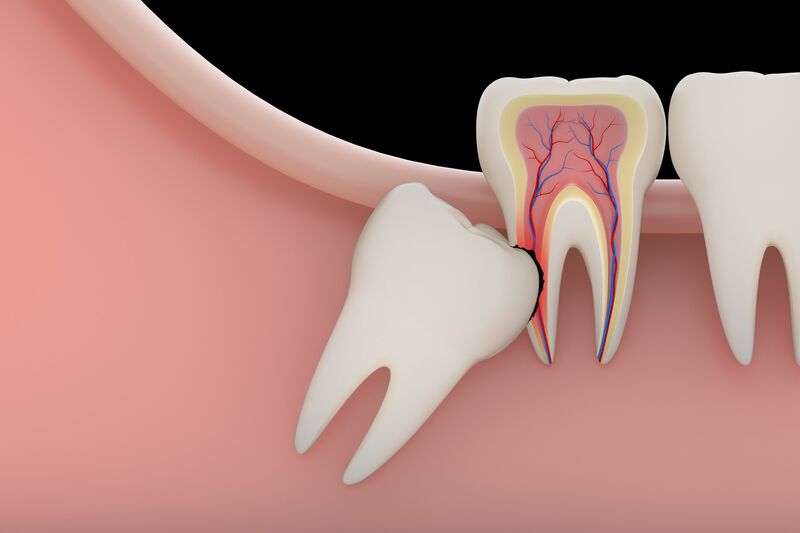 An impacted tooth simply means that it is “stuck” and cannot erupt into function. When it comes to impacted teeth, patients most often experience problems with impacted third molar teeth, better known as wisdom teeth. These teeth get “stuck” in the back of the jaw and create openings that can lead to various types of oral infections. 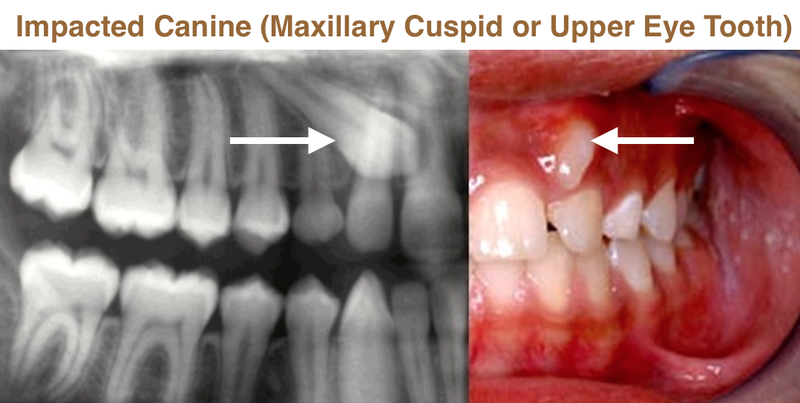 Coming into place at around age 13, the maxillary cuspid teeth are the last of the front teeth to erupt into place. And because of this, are extremely important in closing any remaining gaps that may hinder a person’s bite. If someone experiences impacted maxillary cuspids, interestingly enough, there is a 60% chance that their impacted eyeteeth are located on the palatal (roof of the mouth) side of the dental arch. The rest of cases (roughly 40%) the impacted eyeteeth are located in the middle of the supporting bone. In this scenario, the tooth remains stuck in position above the roots of the adjacent teeth. Are there extra teeth present? Are there unusual growths that are blocking the eruption of the eyetooth? Is there too little space available, causing an eruption problem with the eyetooth? If your dentist identifies a problem they will typically refer you to an orthodontist to fix the issue before it causes other problems. For additional information please visit our page on the exposure of impacted teeth. The treatment you’ll receive following your examination depends largely on two things: the severity of the problems identified and your age. If the eyetooth develops too much (typically between ages 13-14), the impacted eyetooth will not erupt by itself. Even with the space cleared for its eruption. Alternatively, if the patient is older (over 40), there is a much higher chance that the tooth will be fused into position. Causing the tooth to stay in place despite eruption efforts from both the orthodontist and oral surgeon. Sadly, the only option at this point is to extract the impacted tooth and consider an alternate treatment to replace it in the dental arch with either a crown on a dental implant or a fixed bridge. In cases where the eyeteeth will not erupt spontaneously, the orthodontist and oral surgeon will work together to get the unerupted eyeteeth to erupt. This will require the patient to go through both exposure and post-exposure processes. The most cases, we recommend that you see an orthodontist and have them place braces on the teeth (on at least the upper arch). By using orthodontic treatment the orthodontist will create a larger space to provide room for the impacted tooth to move into its proper position in the dental arch. If the baby eyetooth is still intact, the orthodontist will usually leave it in place until the space for the adult eyetooth is ready. Once ready, the orthodontist will refer the patient to the oral surgeon to expose the impacted eyetooth and bracket it. Once the eyetooth is ready, the gum on top of the impacted tooth will be lifted up to expose the hidden tooth underneath. If there is a baby tooth present, it will be removed at this time. Usually, no bone grafting is required. Once the tooth is exposed, the oral surgeon will bond an orthodontic bracket to the exposed tooth, which will have a miniature gold chain attached to it. The oral surgeon will then guide the chain back to the orthodontic arch wire where it will be temporarily attached. Most of the time, the gum will be returned to its original location and sutured back with only the chain remaining visible as it exits a small hole in the gum. What Happens After You See An Oral Surgeon? Shortly after surgery (1-14 days) the patient will return to the orthodontist and a rubber band will be attached to the chain. Putting an eruptive pulling force on the impacted tooth. This will begin the carefully controlled process of moving the tooth into its proper place in the dental arch. Remember, the goal is to erupt the impacted tooth. Not extract it! Once the tooth is moved into the arch in its final position, the gum around it will be evaluated to make sure it is sufficiently strong and healthy to last for a lifetime of chewing and tooth brushing. What If Both Cuspids Need Fixing? It is not that uncommon for both of the maxillary cuspids to be impacted. In these cases, the space in the dental arch form will be prepared on both sides at the same time. When the orthodontist is ready, the surgeon will expose and bracket both teeth in the same visit so the patient only has to heal from surgery once. Because the anterior teeth (incisors and cuspids) and the bicuspid teeth are small and have single roots, they are easier to erupt if they get impacted than the posterior molar teeth. The molar teeth are much bigger teeth and have multiple roots making them more difficult to move. The orthodontic maneuvers needed to manipulate an impacted molar tooth can be more complicated because of their location in the back of the dental arch. In a study from the National Institute of Health, they showed that early identification of impacted eyeteeth is beneficial. They also found that initiating treatment at a younger age results in better outcomes as well. By the time the patient is at the proper age in which the orthodontist can apply braces to the dental arch, the eyetooth will have most likely erupted enough to allow the orthodontist to bond a bracket to it and move it into place. All without needing to force its eruption. In the long run, this process saves time for the patient and means less time in braces (always a plus for any patient!). 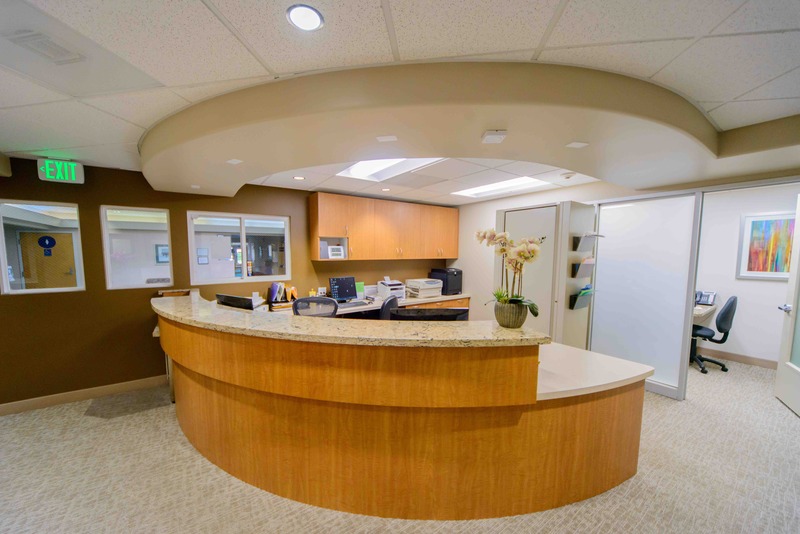 The surgery to expose and bracket an impacted tooth is a very straightforward surgical procedure and Dr. Alan Chun performs the surgery in our office. the oral surgeon’s office. If only one tooth requires treatment it generally lasts a little over one hour. If both sides require treatment it generally lasts just under two hours. You can refer to Preoperative Instructions for a review of any further details. You can expect a limited amount of bleeding from the surgical sites after surgery. 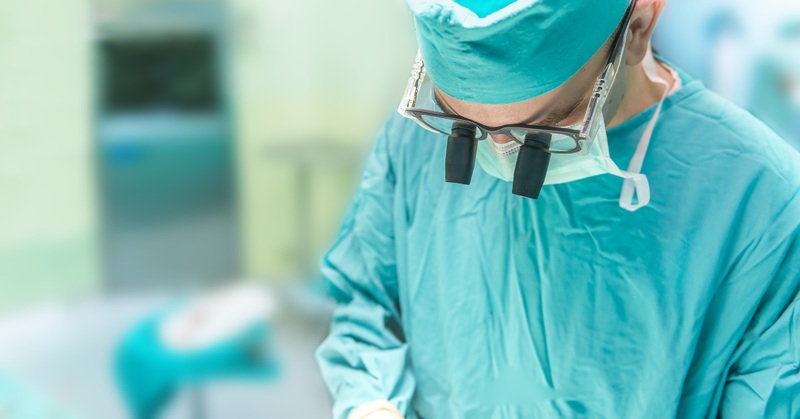 Although there will be some discomfort after surgery at the surgical sites, most patients find Tylenol or Advil to be more than adequate to manage any pain they may have. Within two to three days after surgery, there is usually little need for any medication at all. Swelling of the lips or gums may happen from holding the lip up to visualize the surgical site. The best way to minimize swelling is to apply an ice pack to the lip as swelling persists. However, ice packs are usually the most beneficial 12-24 hours after surgery. Bruising is a fairly uncommon symptom when it comes to these types of procedures. 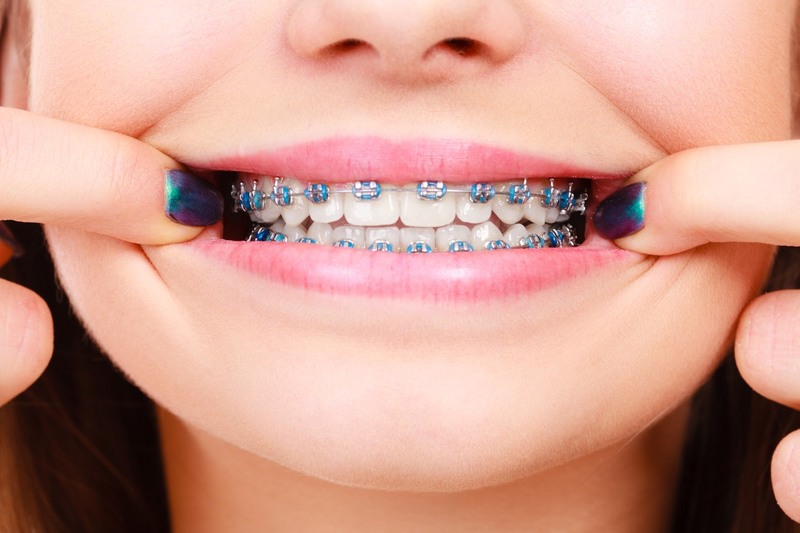 If you feel like you are experiencing some type of deeper bruising (that is different from the standard soreness experiences after these types of procedures) then you may want to contact your orthodontist. In terms of diet, we recommend a soft, bland diet after the initial procedure. However, you may resume your normal diet as soon as you feel comfortable chewing. We also advise patients to avoid sharp foods like crackers and chips. This is because they may irritate the surgical site if they come into contact with your healing wound. Usually, for both cuspid and wisdom tooth aftercare, your doctor will see you seven to ten days after surgery to evaluate the healing process and make sure you are maintaining good oral hygiene. You should plan to see your orthodontist within 1-14 days to activate the eruption process by applying the proper rubber band to the chain on your tooth. As always, Dr. Chun is available at the office and you can reach him after-hours if any problems arise post-surgery. Simply call the office at 925-833-8316 or contact us if you have any questions.